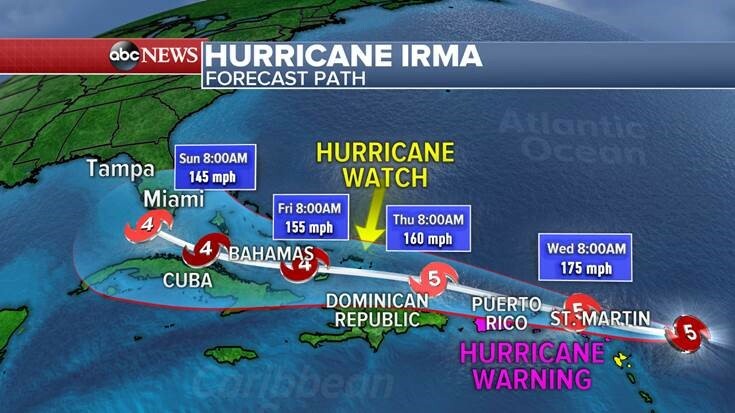 Caribbean Hotel & Tourism Association has sympathized with Hurricane Irma victims and advised the region still in the projected path of the Irma to take continued precautions as it makes its way through parts of the northern Caribbean. The negative effects of Irma have been felt on the dual-island of St. Maarten/St. Martin, St. Barthélemy (St. Barts) and Barbuda. More Casualties on Anguilla, St. Martin, St. Barts and Barbuda, have been reported, electricity and communications are down on several islands and the full extent of the damage is not yet known. Resorts throughout the affected areas in the region, including those on nearby islands in Irma’s projected path, have instituted emergency hurricane protocols. All hurricane warnings have now been discontinued for Anguilla, Antigua & Barbuda, the British Virgin Islands, Guadeloupe, Montserrat, Saba, St. Barthélemy, St. Eustatius, St. Kitts and Nevis, St. Maarten/St. Martin, and the US Virgin Islands. Officials in countries and territories in the southern and western Caribbean not impacted by Hurricane Irma have expressed their concern and support to the affected areas. Irma storm is currently moving west-northwest off the northern coast of Hispaniola, heading for the Turks & Caicos Islands. A hurricane warning is in effect for the Dominican Republic, Haiti, the Turks & Caicos Islands, and The Bahamas. Visit Uganda with Katona Tours and Travel.